This range of weights is fast becoming our most popular beach lead. the short stubby shape pulls everything close , making it more Aerodynamic, whilst the clip which houses the hook in flight can be trusted to open on impact everytime. The ultimate range of leads for todays match anglers. The aerodynamic design of the Impact lead helps put your bait out to the maximum distance and the wire formation keeps you there, where the fish are. This range of leads all use the Impact cone to release the baited hook from the integral bait clip on impact with the water. 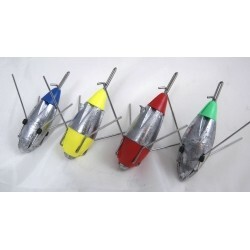 The advantage of this method is that you know when the bait becomes unclipped and as the bait travels through the water its forced onto the hook bend and not up the trace length. All good rigs would still incorporate a bait stop. DESIGNED BY NIGEL FORREST PROTECTED BY FULL BRITISH PATENT AND COPYRIGHT.